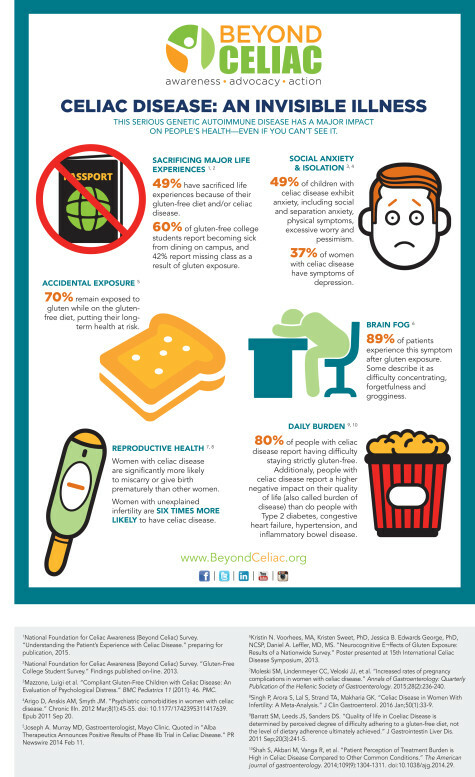 May is Celiac Awareness month and with that in mind, I'd like to thank Elle Magazine for raising awareness by posting the picture above to a combined following of 5.6 million people on their social media accounts with the caption "We all have that friend...🚫🍞"
Hysterical, right? No. Just mean. Oh well, it didn't stop the person who did it from winning even if it was pretty controversial for a while. Celiac disease has become the source of a lot of humor lately. Quite frankly, whenever someone whips out the "gluten-free" joke, you can pretty much assume they've lost the ability to come up with good material or never really had it to begin with. 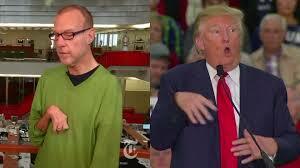 It's pathetic to make fun of people with a disease or disability. Visible or invisible. Some may say they are targeting people who eat gluten-free because it's a fad, to try to lose weight or are just plain finicky. I have issues with that too. 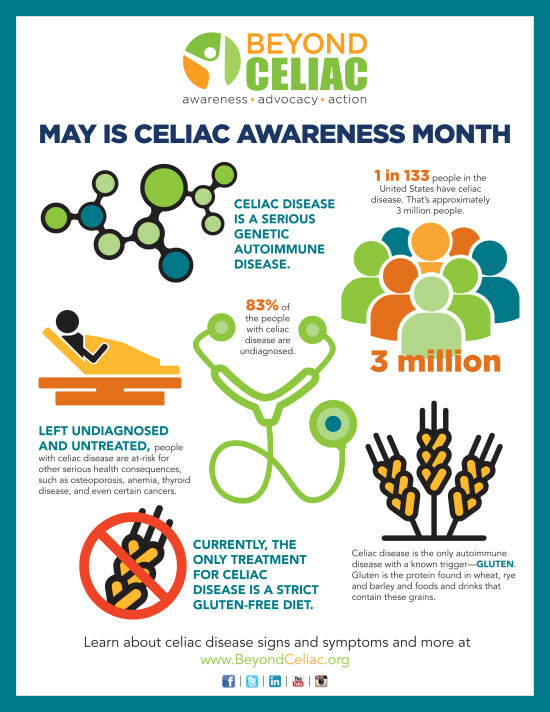 Not because I care how other people eat or live their lives, mainly because it makes it 10 times harder for my 2 sons and me, who actually have celiac disease, and others with a gluten intolerance or other medical issues to have any credibility. But hey, you don't hear me making fun of them, do you? Want to know why? Because it's not my business and it is not nice. Elle Magazine, I don't think it's your business either. Quite frankly, unless you want to raise awareness in a positive way, I think you should just leave the topic alone. Now, I know you did take the comic down from your Facebook and Instagram accounts after seeing Gluten Dude's post and receiving comments from tons of people who were horrified and upset. That was a bit cowardly. Especially since you didn't offer an apology. I actually think you should put it back up. 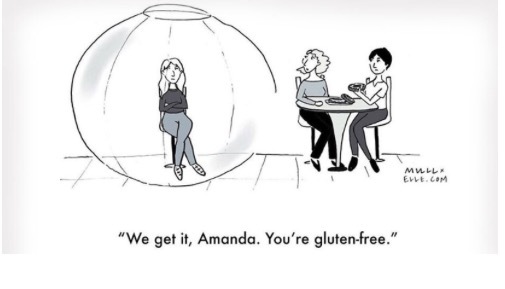 Just take off the "We get it Amanda..." part and replace that with "How it feels when you have celiac disease." Can I vent a little about my pain? I am a chef. I went through culinary school and worked in the test kitchen at Bon Appétit magazine. Do you have any idea how much deliciousness was around me that I could not eat? I still suffer a little every time I go out to a restaurant and can't just order anything on the menu. Oh and I am dying for a slice of NYC pizza, some good bread from Balthazar or to see what the big deal is with a Cronut. Trust me, I would eat all of the gluten if I could and so would my kids but we can't, not because we want to be that person but because we will get sick. Elle, I don't mean to take it all out on you. You just jumped on the gluten-free shaming bandwagon because it was cool. I get it. You are far from the first and you will surely not be the last. As a matter of fact, you are in great company. Just this past weekend, my kids went to see The Angry Birds Movie and came back to tell me it made fun of people who were gluten-free. Awesome. A kids movie teaching little ones to grow up and make fun of people with celiac disease.